In the next month, Takeoff plans to launch an automated, hyperlocal fulfillment center that will serve 14 Sedano’s stores in the Miami area and offer grocery pickup services to the Hispanic supermarket chain’s customers. “We are excited to partner with Takeoff at the forefront of this groundbreaking robotics solution,” Javier Herran, chief marketing officer for Hialeah, Fla.-based Sedano’s, said in a statement. The system works as follows: Customers place their grocery orders via a mobile app, and the orders are received and processed by Takeoff’s automated fulfillment facility, with the support of Sedano’s staff. Takeoff said the artificial intelligence-enabled robots can assemble grocery orders of up to 60 items in several minutes, a fraction of the speed — and cost — of current manual-picking options. “This model gives us the ability to leap into the e-grocery industry, develop a new level of employment opportunities and continue meeting the needs of our valued consumers by offering an affordable and convenient online service,” said Herran. Overall, Sedano’s operates 34 stores in Florida’s Miami-Dade, Broward, Palm Beach, Orange and Osceola counties. Takeoff said it’s currently working with five regional and national U.S. retail chains and plans to deploy several automated fulfillment sites next year. The company is targeting compact, vertical spaces to develop hyperlocal facilities that are an eighth the footprint of a typical supermarket. Retailers use their existing e-commerce platform or Takeoff’s customized user-interface solution for taking online grocery orders. Acting as a hub, the automated fulfillment centers provide a lower cost-to-serve by covering the expense of order assembly and last-mile delivery/pickup. 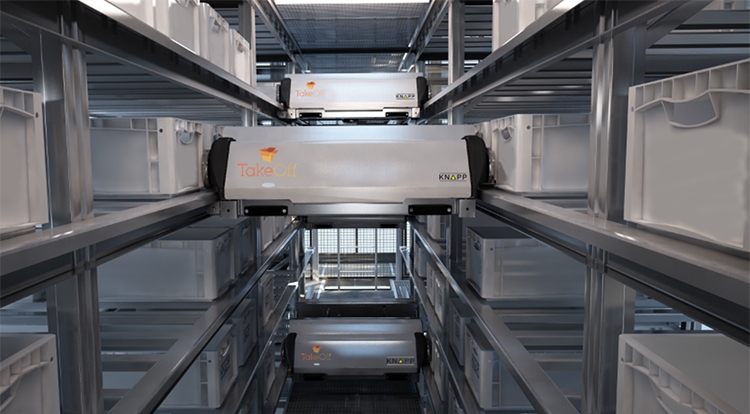 For the robotics technology, Takeoff has an exclusive agreement with Knapp, a global provider of automated warehouse solutions. Sites for Takeoff’s fulfillment centers include urban and suburban locations. The company noted that retailers can use its solution to leverage underutilized real estate and turn existing stores into micro distribution centers. In an August interview with grocery advisory firm Brick Meets Click, Aguerrevere and Pedro said Takeoff works with retailers to identify 8,000- to 10,000-square-foot spaces in existing locations for its automated fulfillment system, which includes robotics plus e-commerce, online inventory management, customer service, reporting and analytics functions. The robotics can pick up to 900 items per hour versus 60 items for manual in-store picking, and the system can process 3,500 online grocery orders weekly week per location for a two-hour service. Takeoff added that former Ahold USA CEO James McCann, now CEO of McCann Investments and Advisory, has joined the Takeoff Advisory Board and is an investor. The tech firm also has closed Series B financing led by Forrestal Capital, bringing the total capital raised to $46 million. At a recent roundtable discussion with Supermarket News, Jefferies analyst Christopher Mandeville noted that automation will play a bigger role for grocery retailers as they rationalize their online and brick-and-mortar operations. “I think automated fulfillment from the store level, particularly when it comes to center store items, is going to be meaningfully important on a go-forward basis in order to cover all of your fixed and operating costs for the four walls,” Mandeville said.